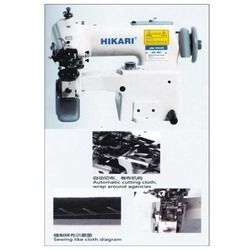 Hikari(shanghai) Precise Machinery Science & Technology Co.,Ltd is one of the world's largest manufacturing and researching center of industrial sewing machine. 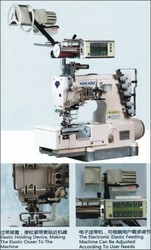 We focus on high-end; we are the creator and the leader of the global computerized overlock machine. 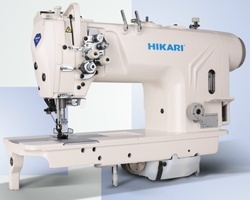 Reach a maximum sewing speed of 2,500 rpm, increasing production efficiency. Beautiful thread trace, may sew top grade products. Operation board of easy manipulation. HBH-9280 electronic eyelet button holer machine adopted high speed drive of the ideal device structure, the toppest sewing speed could reach to 2500 rpm, it's obviously faster by comparison with previous 2200 rpm. The servo control of thickness of components in the strengthening needle pole, cloth sending device and needle pole rotation device shortens the operation time, which decreases by 13% compared with the traditional. 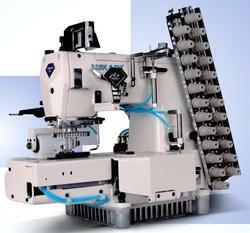 World advanced dry head direct drive electrical buttoning holing machine, sufficiently applies many unique designs. Except hook, it realized lubrication without oil which refuses oil stains and also realized 4200 rpm/min at highest speed; it can effectively sew various straight end button hole. Particularly designed bottom, thread trimmer mechanism with advantages of fast speed and high efficiency comparing traditional model, workers do not need to pick any thread after thread trimming. Using new designed electrical clamp device can intelligently memorize thread tension of every sewing parts, it realizes beautiful sewing quality. Electrical automatic presser foot lifter, the height presser foot can be adjusted depending on needs. 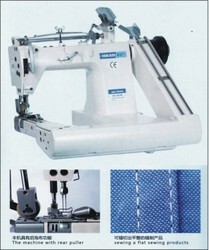 It can quickly position the location of button hole and largely shorten process time and reduce work intensity. Full functional control board proving intelligent human computer interactive interface, it makes workers can quickly choose sewing pattern. The blind stitch leaves no stitches on the surface of the belt loop and makes the garments pleasing to eyes. 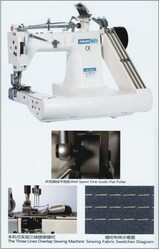 Lower thread trimmer automatically cuts the edges, which can be made use of leftover materials directly. Newly designed front feed dog and cloth support solve non seam between two pieces of fabrics, improve the efficiency. Automatic rolling plate, bracket and relative setting mechanism reduce efficiently the operation errors, improve the efficiency and guarantee sewing quality. For link tacking the dress bottom, trousers waistband. Ideal for sticking trademarks, labels or alike on knitted coat necktie, coat suit lining, cuff and waistband of trousers. Beautiful fastened straight line tacking stitch can't be seen from the outside. For trousers, jeans, overalls and leisure wear etc. Lockstitch cylinder bed with asynchronous puller behind the needle, which continuously operates up and down. Lapping width of the lapper assy. is 12.7mm perimeter circumference of the cylinder bed 200mm. For buttonholing the flat two hole four hole buttons, shank buttons on the shirt, suits, overall etc. Bearing driving gets the running smoother, smarter. Double (top cotton & lower pool) oil feeding. 2 Needle Feed Off The Arm Chain Stitch Machine The special cantilever tubular shaped structure is for sewing different materials, such as shirt, nylon raincoat, car cloak and boot etc, specially for joining the sleeves, trousers and such kind of caliber materials, with a set of lapper assy. Independent lopper makes itself easier for adjustment, the needle moves with the feed dog which moves forward or backward. The machine is for both light weight and heavy weight materials. 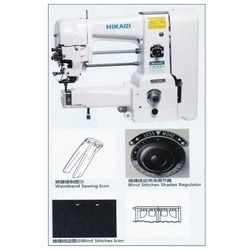 The auto presser foot lifting makes it easy to operate, suitable for attach elastic lace. Direct Drive Oil Computerized Lockstitch Sewing Machine The new generation product of the world acclaimed oiling direct computerized lockstitch machine, retain the excellent characteristics widely regarded as HIKARI Mode improve further the shell and the internal structure, make the performance more superior and increase more 15% efficiency than many brand on the market. The integrated design combined with high end chip and servo motor, integrate organically the mechanical parts and electric control system, reduce the failure rate. Re-design LED light, the lighting angle is more reasonable provide powerful guarantee for workers sewing. 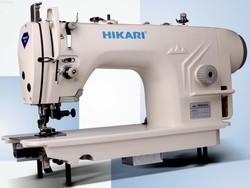 Equipped with hikari newly developed electronic thread clamp device, compared to many copycats on the market, the hikari electronic thread clamp device based on technical background from hikari independent research and development can really play its due performance achieves the seam surface wireless head and effectively reduce the bottom nest phenomenon. Using new coupling effectively reduce the loss when operating under high speed and reduce the noise. Based on the insist to use the high quality parts and strict quality control, this model at the same speed the noise is lower 2db than international brands. Perfect designed the cutter into lockstitch machine and equipped with direct drive servo motor, auto needle positioning, auto trimming and the rest functions. It can greatly enhance stitch quality and working efficiency but the price is only 1/3 compare to other global brands, thereby it has high cost performance. In order to avoid oil leaking problems from the cutter, HIKARI optimized design the cutter rest part to put an end to oil leaking problem accordingly improved oil pollution. The cutter holder shaft is been platted with nano materials and its hardness of surface can reach over Hv550. Besides the standard 1/8 gauge set, it adds two more gauge sets 1/4 and 3/16 to meet different need of different procedures, Moreover there is no need to change the baiting slot when changing gauge set so that cancels many troubles. Caring users attentively and humanized build the LED light into the machine body thus enlarge the working space and enhance brightness in cutter and sewing areas. The LED light has three levers any you can adjust to different lever according to different color of the fabric and it makes labor's eyes feel more relax and comfortable. The mechanical structure optimized and upgraded a number of patented designs, has completely changed the transmission design of existing products on the market the significant leading is undisputed, it can improve the working efficient by 20% and save the energy by 60%. Automatic trimming avoid the line waste, increase more efficiency and reduce the load of labor at the same time. Automatic presser foot lift function makes worker more relax and easier. The well design of LED light have many degrees, can make the labors easily work and make sure the quality of the products as well, make the machine have the humus consideration together with the realistic use. Under the innovative patented design, the problem like traditional similar varieties with high noise, high vibration, the needle bar chain eye, other parts easy to wear, low service life all have been effectively solved by this machine. The machine service life is expected to be two times than traditional models and even in the high speed the operation is still smooth, comfortable and makes operator pleasant. The first design of multi axis servo control system, compared with the original backward stepping motor system, effectively solves the phenomenon of stepping motor is easy to loss caused by broken needle and not reset under the situation of moving machinery, combined with the high speed cutting tool and the improved presser foot device, effectively shorten the set time, in order to achieve the world's fastest bar tacking machine, with the highest 3300 rpm model. When the machine does not work, the stepper motor is still energizing and making vast heat while the servo motor will not deliver power thus can sharply avoid machine ger heat and save energy as well. Meanwhile, due to advanced servo system there are no longer need the sensor mechanism which makes a more cleaner inner space, easier to maintain and save cost to replace a new sensor. Hikari's patented electronic thread clamp device the acclaimed thread clamp device function to the sets of bar tacking machine, effectively reduce the bird's nest phenomenon at the bottom of fabric, at the same time no longer need to thread wipe, end the dangerous of hurt the hands during the use. Dry machine head, avoid oil spill risk, needle bar adopt Me-DLC diamonc coating, even without oil lubrication, still ensure the service life. 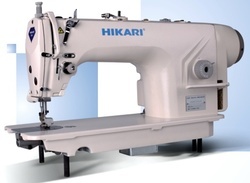 The humanization of a thread function, starting this function, the needle bar automatic return, all thread clamp automatically release, makes the threading easier, faster, the machine head is also equipped with Hikari new around adjustable brightness LED lights, so lighting is more comprehensive. Use the advanced built in detection sensors, more stable than old safety switch, in order to ensure the safety of maintenance process. Integrated aluminium electric control box, ensures better cooling performance and has the higher strength, guarantee the safety of electronic components. Latest design of the control panel shows the optimal user interface and high resolution display screen gives you a sense of intuitive and bring lots of convenience. New type of touch key with faster responding instead of the traditional key that facing problems like aging, failure etc. This is product that can compete with first class international brands, automatic needle stop positioning automatic trimming, automatic back stitching and automatic wiper mechanism, maximally realize sewing automation which is convenient for work shop management, adopted servo motor control system and significant advantages in quick responses and increasing speed. New designed automatic trimmer assembly has more reasonable straight knife mechanism, short distance of cutting thread, high effectiveness and convenient maintenance after comprehensive test. Adopted minimum oil lubrication technology and improved hook lubrication mechanism. Makes hook lubrication more sufficient that ensures its longer life and sewing performance. Adopted servo motor direct drive technology which can save electricity by 2/3 and make this machine run more precisely. 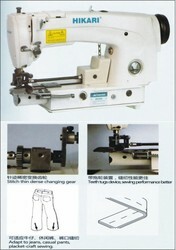 Improved double needle bar and needle plate, it increases sewing performance. Increase productivity by 15% - 30%, decrease work intensity by 20%. Adjustable LED light with 3 levels convenient for end user to adjust for different colors of material. Independent loppers are easy for adjustment. The mechanical drive sophisticated cloth puller avoids it from light run.